Broadchurch actor Joe Sims has revealed that plans could be in place to turn the ITV drama into a film. Sims, who plays Nigel Carter in the series, said that a film adaptation would be “very exciting”. He told OK! : “The only thing we’re bound by is the imagination of (creator) Chris Chibnall which actually means that we’re bound by nothing. The series’ last ever episode aired last night (April 17). It ran for three series. Filming for the show’s third and final series took place in Dorset last summer. David Tennant, Olivia Colman, Andrew Buchan, Arthur Darvill, Carolyn Pickles, Adam Wilson and Jodie Whittaker all returned with Julie Hesmondhalgh, Georgina Campbell, Sarah Parish, Charlie Higson and Mark Bazeley joining the cast for the eight-part series. 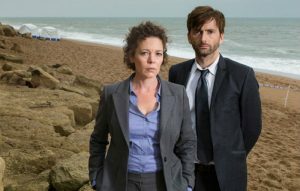 Series one of Broadchurch aired in March and April 2013 and followed David Tennant’s DI Alec Hardy and Olivia Colman’s DS Ellie Miller as they investigated the murder of schoolboy Danny Latimer in the fictional Dorset seaside town of Broadchurch. Series two, which aired in January and February 2015, followed the trial of Latimer’s alleged murderer while also tracking Hardy’s attempt to crack an unsolved case from his past. The post Is ‘Broadchurch’ being turned into a film? appeared first on NME.